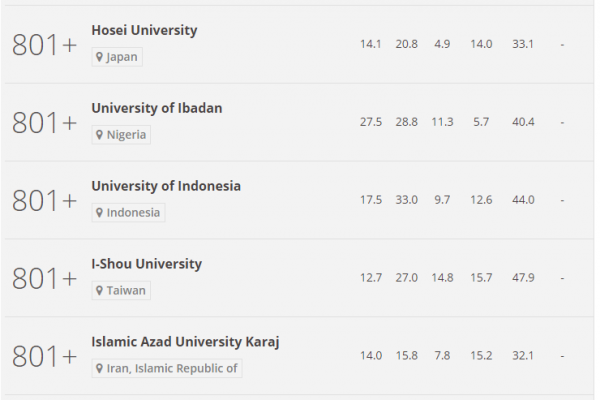 The first and the best university in Nigeria, University of Ibadan has secured a spot in the top 978 ranked universities in the world. In the ranking released by the Times Higher Education, Nigeria’s premier university was ranked 801 alongside several others. UI was also the only Nigerian university to make the list. Earlier in 2016, the Academic Ranking of World Universities (AWRU) and the Center for World Universities Ranking (CWUR) released a list of the top 500 and 1000 world universities respectively and no Nigerian university was on the list. CWUR said that Nigerian universities were not considered for the ranking because of lack of quality research. AWRU, who did not give a reason for Nigeria’s absence, made it clear that the criteria for ranking were the number of alumni and staff publishing journals in Nature and Science, number of alumni and staff winning Nobel prizes and Field medals. South Africa and Egypt had the highest number of universities on the list from the continent. 63 universities from the United states made it to the top 200 while 32 from the United Kingdom also made the cut. The United States had 63 universities among the hundreds of schools considered.